My huMom is looking for a new copy of a book she read by dog trainer Kevin Behan called, “Your Dog Is Your mirror”. She found it a fascinating read & I thought why not bark out about it. The premise of the book is that a good dog doesn’t respond to its owner based on what the owner is thinking or even saying. Behan believes dogs respond to what the owner feels. In a way, dogs can actually put people back in touch with their own emotions. Kevin’s theories challenges the reader to examine a dog’s behavior as an emotional reflection of its owner, potentially revealing unresolved issues. Kevin grew up training dogs alongside his father, John Behan , who was an early professional dog trainer. Kevin has worked with thousands of dogs & through this experience he developed his theories about the connection between us dogs & you humans. Have you sniffed out this book? If so I’d like to hear your thoughts. My huMom found it difficult to put down. It offered a fresh new perspective that resonated with her. She did find it at her local public library but has decided to purchase a copy of her own. 🙂 HuMom said it’s worth the read. Haven’t heard of it but will keep my eyes on the lookout. 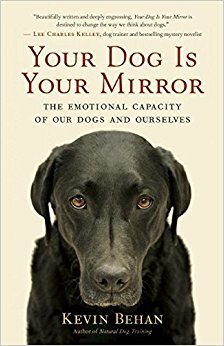 Dogs pick up on energy so the mirror analogy makes ‘pawfect’ sense.